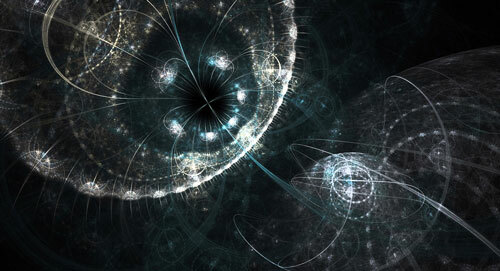 Quantum physics is weird. To begin to understand it, you have to set aside everything you thought you knew about space and time and develop complex, abstract models of a universe in which the tiniest divisions of matter exist in constantly changing states and where the normal rules of action at a distance don’t apply . . .
Oh, wait. That’s Emanuel Swedenborg. Spiritual concepts have nothing to do with space. They have to do solely with state, state being an attribute of love, life, wisdom, desires, and the delights they provide—in general, an attribute of what is good and true. A truly spiritual concept of these realities has nothing in common with space. . . .
Swedenborg emphasizes that space in the spiritual world is nothing like ours: he describes angels traveling over huge distances in an instant to reach someone who is thinking about them, communities of angels who are bound together by similarities in their states of love and wisdom, and surroundings that change in response to people’s thoughts and emotions. During the eighteenth century, when Isaac Newton’s laws of physics were still brand new, this must have been hard to imagine. Today, quantum physics is giving us new ways to think about the universe that have interesting parallels to what Swedenborg described. Entanglement occurs when two quantum particles interact with each other so that their quantum states become interdependent. If the first particle is in state A, say, then the other must be in state B, and vice versa. Until a measurement is made of one of the particles, its state is undetermined: it can be regarded as being in both states A and B simultaneously, known as a superposition. The act of measuring ‘collapses’ this superposition into just one of the possible states. In other words, if two particles are entangled, they function together as a single system. An action taken to affect one will also affect the other, no matter how far away they are. You could visualize this on a larger scale by imagining a pair of dice: if the dice were entangled in the same way that particles can become entangled, then when rolled simultaneously they would always turn up matching numbers, even if one die was on the opposite side of the planet from the other. Entanglement between particles can happen as a result of almost any type of interaction, as long as they are close enough to affect each other. The effect can be almost unmeasurably brief (for example, when produced in a lab, as described in the article referenced above) or it could last indefinitely. All motion in the spiritual world is the effect of changes of inner states, to the point that motion is nothing but change of state. . . . This being the nature of motion, we can see that drawing near is likeness of inner state and moving away is dissimilarity. This is why the people who are nearby are the ones in a similar state and the ones who are far away are in dissimilar states. It is why space in heaven is nothing but the outward states that correspond to the inner ones. In Swedenborg’s case, the interaction between two souls is a thought or feeling—an emotional or spiritual state that can either draw individuals closer or drive them apart. This works not only for individuals, as described above, but for communities of angels in heaven, who are bound together by similarities in the things they love (Heaven and Hell §§41–44). And, like quantum particles, two individuals can align either briefly or indefinitely, depending on their internal qualities. Of course, the similarity isn’t perfect; as far as scientists know today, quantum entanglement can’t be used to move objects or information through space. But the idea of two objects being so aligned that they can affect each other regardless of the distance between them is one that has a powerful resonance in Swedenborg’s thought. If we use quantum entanglement as a model, we see love as the glue that connects people together. In fact, in many places, Swedenborg observes that love is life itself (for example, the very first sentence of Divine Love and Wisdom). If that’s true, then when people share a common love, they share a common life—a common existence that stretches from this world to the next. Mark Van Raamsdonk, a string theorist at the University of British Columbia in Vancouver, likens the holographic concept [of the structure of the universe] to a two-dimensional computer chip that contains the code for creating the three-dimensional virtual world of a video game. We live within that 3-D game space. . . . Bringing these two ideas together gives us a new way to think about loving others: If there was no love connecting us as individuals, connecting individuals into communities, and connecting communities into a larger and larger whole, then our spiritual universe would fall apart. Loving everybody might seem like a difficult goal, but loving the people closest to you just might be the first step in the process of bringing all of creation a little bit closer together. For even more parallels between quantum mechanics and Swedenborg’s writings, watch “Spiritual Physics” and “How to Travel in the Afterlife,” two episodes of our weekly webcast Swedenborg and Life on the offTheLeftEye YouTube channel. You can also download all of Swedenborg’s writings, including the two works mentioned above, from our bookstore.